If we find we have enough interested we will schedule a small group to get together for a Learn to Paint in 2018. We will be at the St Mary's County Fair in the Arts & Crafts Bldg. on September 21st - 23rd. Stop by our booth and visit to see if you'd be interested in at least giving it a try. This is stress free and we use patterns. There is no drawing experience required. We will teach you a few basics and hope that you'll join our chapter to learn more or pursue decorative painting on your own. You will be provided with everything you need to complete the project and an instructor will be with you every step of the way to help you. Students will learn how to trace, basecoat and use a variety of decorative painting techniques which may include floating color, dry brushing and line work. 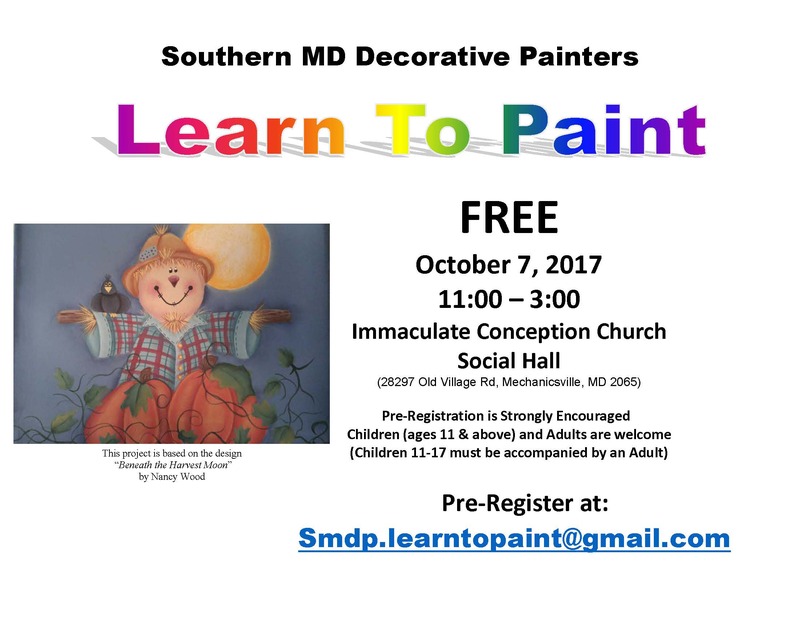 Email smdp.learntopaint@gmail.com if you have any interest or questions concerning a Learn to Paint or contact Garnett Joy - (301) 452-7099. Thank you.